The Cyclops is a medium format (nominal 6x17cm, actual 58x150mm) swing lens panoramic camera, giving four exposures on a 120 roll, or eight on 220. Made by Double W, Inc. of Gulliver, MI in the early 1990’s it is one of the rarer examples of the type. 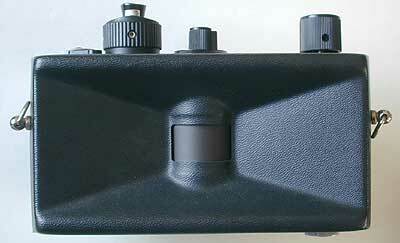 Cyclops camera top plate. 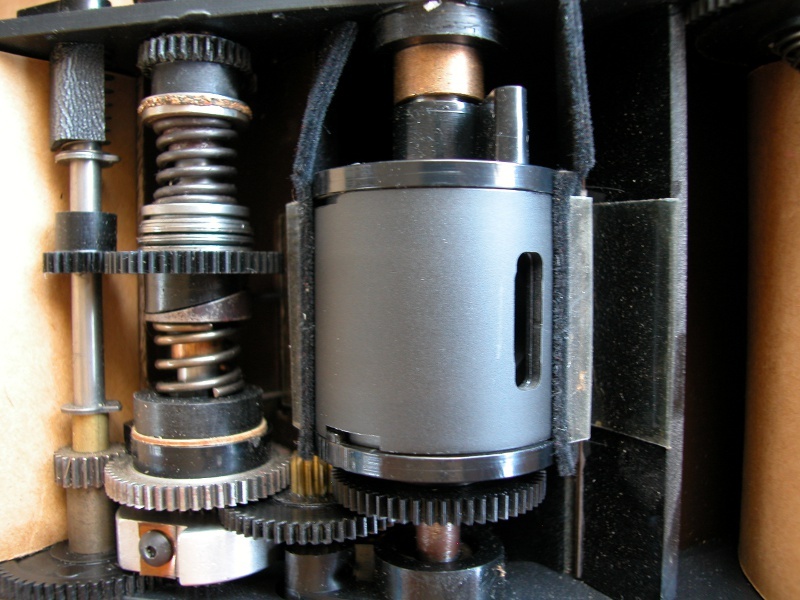 From left to right: film spool retainer, speed control, shutter tension knob, bubble level at the back, aperture control at the front, accessory shoe, frame counter, film advance knob. There were at least three models of the camera. The first has fixed focus, shutter ‘speeds’ of 1/60th and 1/125th second, and apertures of f8 to f45. The manual admits that the image is soft at f8, and claims 15’ to infinity focus at f11. From inspection of the lens, f8 is probably the maximum aperture. Assuming the usual medium format circle of confusion of 0.07mm, that would indicate an 80mm lens focused at around 27’. The focal length is borne out by measuring the radius of the camera back. For contact prints or 2x enlargements, that is probably adequate, though f16 to f22 would be better. Obviously a camera for use in good light only, and with medium to fast film. Film advance is by counter, though there is no film stop. Since there is no red window, this allows the use of 220 film. Double exposures are possible, so with a static subject and a really solid tripod it might be possible to make multiple exposures in lower light. The second model has extra markings on the controls, a modified aperture control, and a basic focus system that altered the lens to film distance inside the camera. The third model was a powered version, though the only information I have comes from Olaf Matthes’ site. Both cameras are about as basic as they come - plastic shells around the lens and swing mechanism. The angle of view is approximately 110o. They do have a circular bubble level and an accessory shoe. The bubble level is essential for leveling the camera. There is no provision for aligning the camera for verticals, but a twin axis shoe-mount level can be used instead. The shoe cannot be used for flash, since there is no synchronisation and the shutter operates like a focal plane type at higher speeds and only illuminates a slit at any time. The link to the later model above shows an optical viewfinder mounted. The style suggests it came from the same manufacturer. The mechanism is clockwork - spring tension and a geared release. This type of mechanism can suffer from slow or uneven travel. The camera does need to be secured during the exposure, since the mechanism induces perceptible torque. Front view showing the rotating lens mount in the centre. Note that there is no provision for filters on this camera, though gelatins could be taped in front of the lens mount. View of the rear of the camera with the back removed. Film take-up is on the left. The lens mount is visible in the centre. There are film rollers at each end of the film path. There are no guide rails, just the trough. There is no pressure plate and the camera relies on the lateral stiffness of the film and the tension of the film spools to maintain the film position. The camera drive mechanism. The lens is mounted in a cylinder with slots in front and behind the lens. This is surrounded by another cylinder which can rotate freely between two stops. 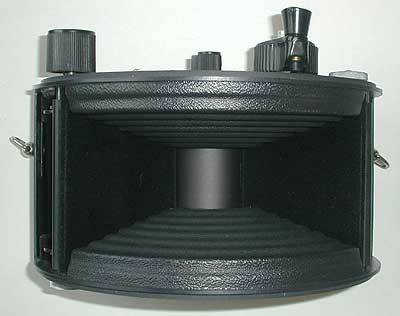 This cylinder has matching slots that align with the internal ones when the lens is uncovered during the exposure, and covers the lens by rotating the other way when the lens is wound. The innder and outer slots are aligned in this picture. The rotation stop is in the slot in the base of the outer cylinder. The aluminium stepped disc in the lower left with the black hex screw is the tension take-up for the brass spring. The spring has fractured at the screw on this camera, and it is not functional. 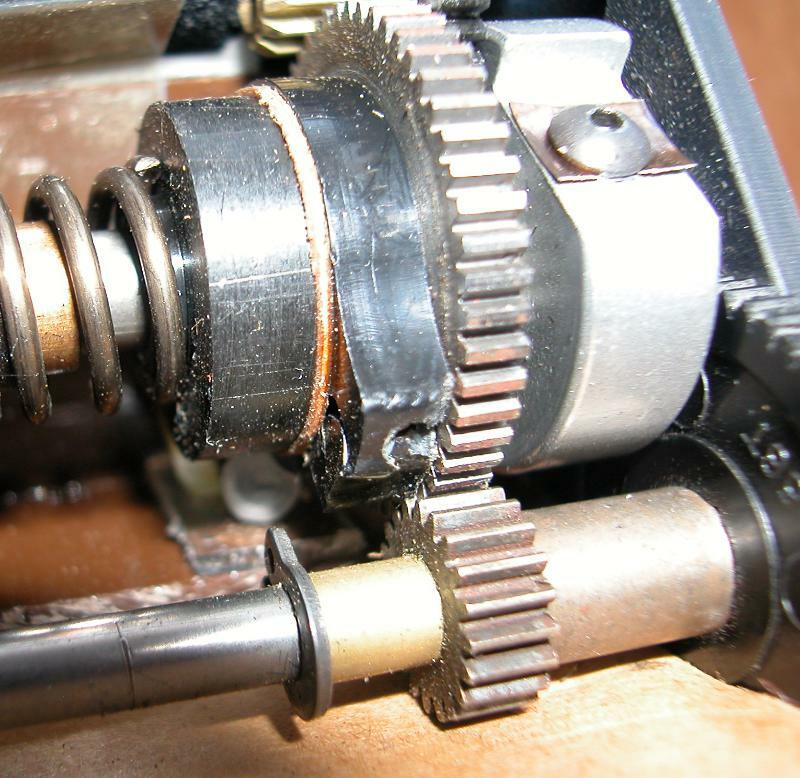 The shaft with the gears and springs is the shutter tension wind. When the shutter release is pressed the ratchet is released and the spring reverses the direction of travel. There is a lot of barrel distortion in this close-up! In the centre of the picture is a black cam that impacts on a spring damper visible blow and behind it as a whitish disc. This is intended to bring the mechanism to a stop and avoid reverse rotation. Since this cam is damaged, the mechanism may have over-rotated, and stressed the spring mounting. The spring causes a noticable kick because of the camera’s low mass. The obvious question is whether it is possible to replace the clockwork mechanism with an electric drive. 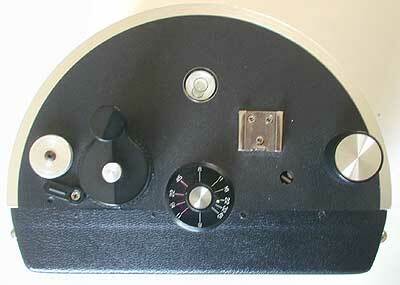 There are electic motors of the right size to fit in the space occupied by the winding mechanism. Some are capable of rotational speeds from 5 to 60 rpm depending on the voltage (1.5 - 9v). The drive would have to be reversible, and limited to 180o travel for the lens. The motor would have to have enough torque to get the lens up to steady speed once exposure starts. It would also need a reverse setting to reset the camera.